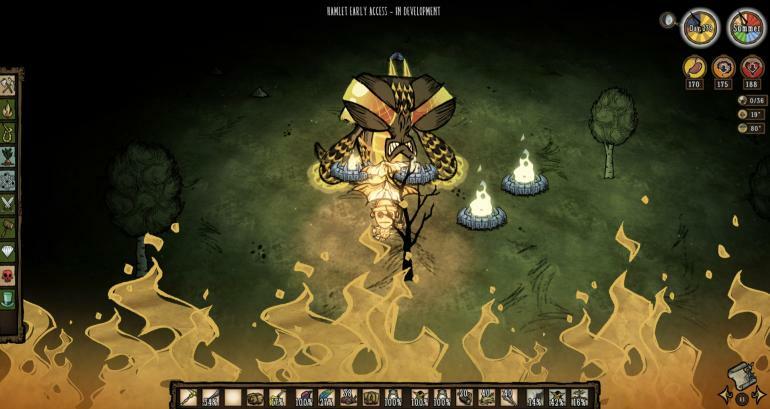 I'm not a new Don't Starve player, but I hadn't played the game for more than two years until about a month ago. I bought the mega pack plus on Steam very recently since it was on sale and I'm having some trouble with RoG. As much as I love it and all the new stuff it adds, I always die at the first summer between days 65-70 and it's really making me frustrated! I feel like going back to vanilla every time I die and sometimes I'm a bit overwhelmed with all the new stuff, but at the same time I want to experience everything the DLC has to offer! Do you guys have any tips on this matter? How can I make my gameplay better? Thanks on advance and please excuse me for any mistakes, English is not my first language! It sounds like you're not preparing yourself well enough for Summer. RoG adding in extra seasons to the game means that we can't just try to survive like we did in vanilla, we also have to be constantly preparing ourselves for the next season and beyond. I also bring an Eyebrella (if Deerclops came during Winter), Tam-o-Shanter, Walking Cane, Thermal Stone, any meals and food from my main base, and some tooth traps for the inevitable hound attacks (unless I'm close enough to my main base to run back to my tooth traps there). I make a Floral Shirt to wear during the Summer - that can only be made once Summer starts though, since it requires Cactus Flowers. If you don't have the ingredients for that (sometimes Silk can be hard to come by), you can make a Luxury Fan from the feathers Goose-Goose dropped in Spring. If you didn't get a Tam during Winter, no worries - cooking Cactus in the Desert will restore sanity. I also bring Glommer with me to the Desert so I can use his gloop for Flingomatic fuel, and Chester in case I need extra storage space. To have all these things, it means I had to prepare for Summer during the prior Winter and Spring. To even build a base in the Desert, I have to explore it to find the ideal spot - sometimes there's carpeted patches in there with Clockworks, which is where I like to build if possible, so I have to clear them out first. Sometimes there are Hound Mounds, so I have to know where they are so I don't build too close. Sometimes it's a tiny Desert with no Cactus or Boulders, so I have to go find the second Desert in my world and explore that. When Summer starts, I turn on Flingomatics in my main base and then leave for the Desert. I spend all Summer there, picking Tumbleweeds and mining rocks, with the occasional jump out to another biome for small resources occasionally. To be honest, Summer is the most boring season, and the first Summer is the worst one. You're just sorta grinding the time away until Autumn begins again. You can get HUGE amounts of grass, sticks, and trinkets (for gold) though, so that's a positive at least. If Dragonfly arrives during the first Summer, I don't bother fighting her. When my character first announces her breathing, I run deep into the Desert, the furthest edge away from everything, and wait for her to spawn. If I have 20 ash, I drop it for her to eat so she falls asleep, then I run away from the Desert back to my main base. Don't worry about what you're leaving behind like Glommer and Chester - they'll be fine for a few days until you can go back and fetch them. Don't forget to check on those Flingomatics at your main base to see if they need more fuel, since you still have another few days of Summer remaining. Thank you very much and sorry for the late response. I decided to stop playing RoG for a while since I was a bit stressed out with it (clearly haha) but I've become so excited with both Hamlet and Shipwrecked (specially Hamlet, I must say) that I forgot about it. I'm just not sure if I'll be able to avoid Dragonfly at first. I'm always so excited to fight bosses, after all they are the main reason I decided to buy RoG in the first place! But I'll be sure to remember what you did if I feel like I'm not prepared enough. Again, thanks a lot for your answer, it really helped me out! you can cheese dragonfly by putting 2 endo fire pits very close to each other and get the dragonfly stuck between the fire pits. Dragonfly's attack will constantly fuel the fire and it would be easier to dodge the attacks since it can't move.